With widespread use of mobile devices and social media, today's consumers are connected and empowered like never before. Shoppers enjoy an abundance of channels and choices and increasingly expect a consistent and relevant experience across all touchpoints. They reward retailers that can deliver a personal touch and guide them to the products they want-and are quick to look to the competition if the experience is off-target and uncoordinated. How can retailers market to these discriminating consumers? 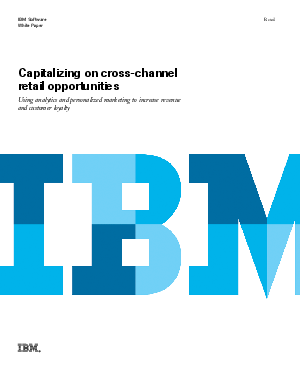 Merchants are challenged to increase their understanding of customer behavior and use those insights to deepen cross-channel marketing engagement. They need to enhance cross-channel consistency as shoppers purchase more goods and services online, shifting business from physical channels. Retailers report that online revenues rose an impressive 28 percent in the 12 months ending in mid-2011, according to a study by Shop.org and Forrester Research. This white paper explores the challenges that face retail chief marketing officers (CMOs) and their divisions.